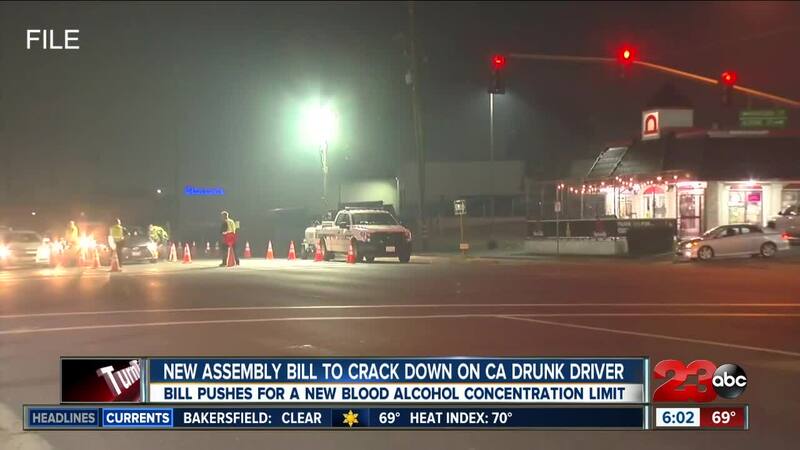 BAKERSFIELD, Calif. — In an effort to crack down on those who choose to drink and drive, a new state assembly bill proposal is looking to amend current impaired driving laws by lowering the legal blood alcohol level. 23ABC News spoke to a local DUI attorney and the Bakersfield Police Department (BPD) to learn more about the impact the new proposal could have. Even though Saint Patrick's Day is a night of fun the last thing you want is for your night to end the wrong way. In an effort to decrease the amount of drunk drivers on the road, last month California democrat assemblywoman Autumn Burke and republican Heath Flora introduced Assembly Bill 1713 which would lower the current legal blood alcohol level of .08 to .05, a move BPD says they support, "We believe it's a positive thing, it's a good thing going forward lowering that blood alcohol level you could still show signs of impairment at a .08 lowering that level even more would hopefully deter people from even drinking at all and driving, "BPD Public Information Officer Nathen McCauley said. According to McCauley last Saint Patrick's Day 14 people were arrested for suspicion of DUI in Bakersfield. California Highway Patrol (CHP) said 131 people were injured in DUI related collisions across the state and a total of 258 people were arrested for a DUI. McCauley said if the new bill passes they will likely see an increase in DUI's in Bakersfield and a stronger ability for the district attorney's office to prosecute alcohol impaired drivers, "There might be an increased number of DUI's there might be an increased tasked on the jail as processing DUI's, there might be an increased case load for the Kern County District Attorney's Office." However, local attorney Richard Middlebrook, who defends people charged with driving under the influence said the bill is targeting the responsible drinkers and the industry as a whole, "You are going to put a great deal of food and beverage industries completely out of business, who is going to go to a restaurant and chance a glass of wine if that's the one that's going to put you over the edge. You are basically targeting responsible very low level drinkers, people who were having a glass of wine with dinner." According to this chart from the Department of Motor Vehicles (DMV) if you are a man and you weigh 180 pounds and you drink three 12 ounce beers you would have to wait two hours before you can drive legally. Bringing your blood alcohol level to .07, but the new law would require you to wait four hours before getting in your car to drive at a .04. If you're a 140 pound woman and you have three five ounce glasses of wine you would have to wait around four and a half hours before you can drive legally. However, the new law would require you to wait more than 6 hours. Middlebrook said regardless of how much is in your system this Saint Patrick's Day, if you are showing signs of impairment on the road you are still subject to a DUI, "Irresponsible driving is irresponsible driving we already have a law in affect that takes care of these issues. If you're driving and you're under the influence of alcohol and it's affecting your ability to drive you're subject to a DUI arrest anyway." The bill is going through the legislative process, and could be approved soon. However, BPD said there will also be a DUI checkpoint at an undisclosed location within the city starting Saturday night at 6 until 2 a.m. Sunday morning, as authorities step up patrols this Saint Patrick's Day weekend.